Steady Rollin' Bob Margolin is a Blues guitar player and vocalist, carrying on the deep Chicago Blues style and creating his original music today. From 1973-1980, Bob played guitar in the band of Chicago Blues legend Muddy Waters, touring worldwide and recording, and learning to play Muddy's powerful music directly from him. During that time, Bob recorded five records with Muddy, played alongside him in Martin Scorcese's landmark film The Last Waltz, and played on Johnny Winter's Nothin But The Blues. Four of those records picked up Grammy Awards. 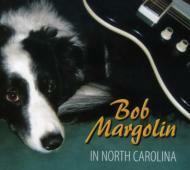 In North Carolina, on his own Steady Rollin' Records label, features Bob Margolin playing his Blues at home. Bob is also a noted Blues writer and journalist, and this CD features a bonus track of Bob reading one of his own Blues stories. Digipak.